Some time ago I wrote about how to control your PC using your Nokia S60 mobile phone (see it here). It consisted in an application written in Python which stablished a connection between the phone an the computer and according to user inputs in the phone it performed one or another action in the computer. I was really interested in programming my mobile phone to develop some applications I have in mind and as I also wanted to learn some Python this past weeks I’ve spent some spare time doing my first applications. I’m going to explain how can you program your S60 phone with Python under Linux and in following posts I’ll try to write some tutorials about how to develop some applications. In order to program your S60 phone with Python, first of all you should get the interpreter and install it into your phone. You can find it in sourceforge (current version is 1.4.5) and where you should download the one according to your phone. As mine is a Nokia N70 I’m using PythonForS60_1_4_5_SDK_2ndEdFP3. Download both the interpreter and the script shell and install them into your phone. I also recommend to download the latest API documentation. 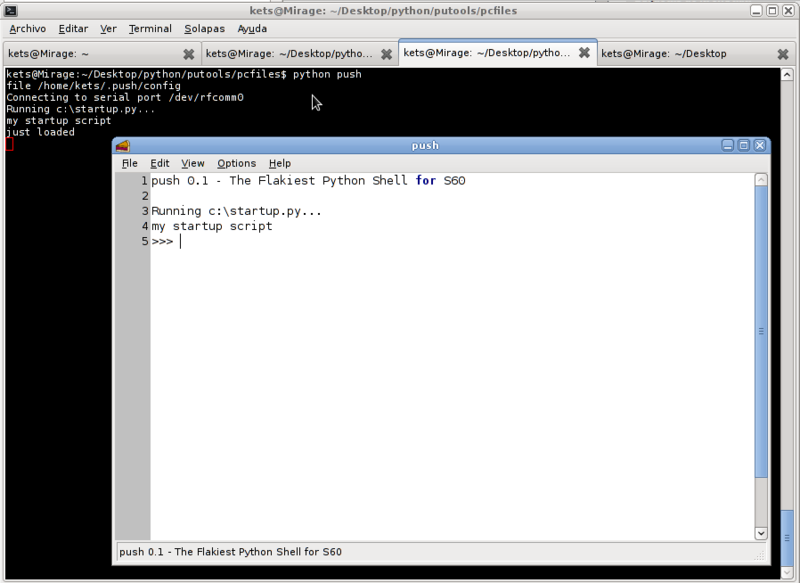 At this point you should be able to execute Python scripts in your phone, by the way, some examples are provided with the interpreter try to run them in order to check that the installation was succesfully done. Programming the application directly on the phone (which I consider very cumbersome so lets discard it). Programming the application on your computer and transfering and running it in the phone (which is not a bad option but, in my opinion, it is not really the best option). In order to do this in a more easy way you could use the PUTools utility which will help you transferring the files, interacting with the phone, taking snapshots… in an easier way through a terminal running in your computer. And now, just run pcfiles/push script to get the terminal which will let you directly interact with the phone! Programming in your computer, testing your applications on it using an emulator, and once the applications are working correctly transferring them to the phone (which for me is the best option). In order to do this, you’ll have to download the PyS60 emulation library (S60-compact) available in sourceforge and which will let you test a lot of your applications directly in your computer without needing to transfer them to your phone. (Notice that modules like camera or some fonts are not available but will be more than enough for letting us introduce in the world of PyS60 programming!). What I usually do is programming the application on my phone, test that it works correctly and later on transferring to my phone with the single following command, and later on run the interpreter in the phone and selecting the transferred script. In following posts I’ll show you how to code step by step a very simple eyecandy-but-useless application covering several aspects of the PyS60 API. It’s been a long time since I don’t write about any computer stuff so here I’m back again showing you how to use your mobile phone as a bluetooth modem under Linux. I needed it a couple of weeks back when I was travelling and wanted to be able to check my e-mail anywhere so I hope it seems usefull for you tu. Altough the process should be quite simple (pair your computer with your phone and then use it) I found lot of troubles while pairing that I’ll show how to solve. First of all you should check if your mobile phone supports acting like a bluetooth modem so do ‘sdptool browse’ and look for something like “Dial-up Networking” (obviously have your bluetooth enabled in both PC and phone). Okey, now lets pair both devices (here is where I found most of my problems) as none of the pages I found showed how to do it. Pairing means allowing a connection from PC to mobile phone or vicebersa. Edit your ‘/etc/bluetooth/rfcomm.conf’ to assign a device (MAC) and channel, use which you get in the previous step. Now let’s try to connect using ‘rfcomm connect rfcomm0’ which will prompt a message in your mobile phone to allow or deny the incoming connection and probably a PIN number. So, this mean that what’s going wrong is that you insert any PIN in you phone and the computer doesn’t recognize it so it denies the connection request. If you have the ‘gnome-bluetooth’ package installed it is said that it should prompt a PIN code to insert the same PIN that you inserted in your phone but, at least for me, it’s not working. The solution? Use bluetooth-agent which sadly doesn’t have any man page so I had to do several tests in order to make it work. You might have to make some changes if you’re using a different network operator like phone number, username, password and the Init3 part where here it says “grps-service.com”. For the first one contact your operator, and for the following check in your mobile phone: tools -> settings -> connection -> access points, and choose the one you’re using to see the correct values. Este blog no prometía nada de informática y Linux pero como se supone que tiene que reflejar mis actividades voy a comentar una que llevaba bastante tiempo rondándome por la cabeza y así sirve para que a otros no les pase lo mismo. Hace tiempo que trasteo con los móviles, el bluetooth y el ansia de poder controlar mi ordenador mientras estoy tirado en la cama. Conseguí hacerlo con mi anterior móvil, un SonyEricsson T610 y ahora que tengo un Nokia N70, se suponía que todo iba a ser mucho más fácil pero no lo ha sido, así que voy a explicar más o menos como he conseguido hacerlo. Para empezar diré que hay muchas maneras y programas para hacerlo pero tras mucho buscar y probar, el único que me daba resultados medio decentes era el PyS60RemoteControl que sirve para cualquier móvil capaz de interpretar Python. No entraré en detalles de como instalarlo, ya que se puede encontrar en la página del programa y en los readmes que lo acompañan. Sin embargo a la hora de la configuración ha sido bastante complicado, así que aquí expongo como hacerlo funcionar ya que en la web del programa no hay casi ninguna explicación. Después de hacer esto ya se puede conseguir la conectividad entre el ordenador y el móvil, pero probablemente sólo funcione el plugin del XMMS. Da igual ponerlo incrustado en el kernel o como módulo, pero si lo ponéis como módulo, acordaros de cargarlo mediante el comando ‘modprobe uinput’ y agregarlo al /etc/modules (o usar la herramienta modconf que lo agregará directamente al cargarlo la primera vez). Gracias a esto podéis usar el móvil para controlar el ordenador al hacer presentaciones o chorradillas así. Ahora ya podéis ver los videos tirados en la cama y subir y bajar el volumen, cambiar entre fullscreen mode o normal, pausar, avanzar… ¡a disfrutar! Que se vea la pantalla del ordenador en el móvil (se supone que al utilizar el ratón se tendría que ver). Configurar el plugin del ratón para que responda a mis teclas y no a las que vienen por defecto.